The Erie Otters envision Dylan Strome and superstar Connor McDavid developing the telepathy of any great offensive tandem. It turns out the pair got started on their rapport rather early, long before the possibility of teaming up in the OHL was even started. "We bonded a little bit last summer at the All-State All-Canadians Mentorship Camp and got kind of close there," says Strome, whom the Otters selected No. 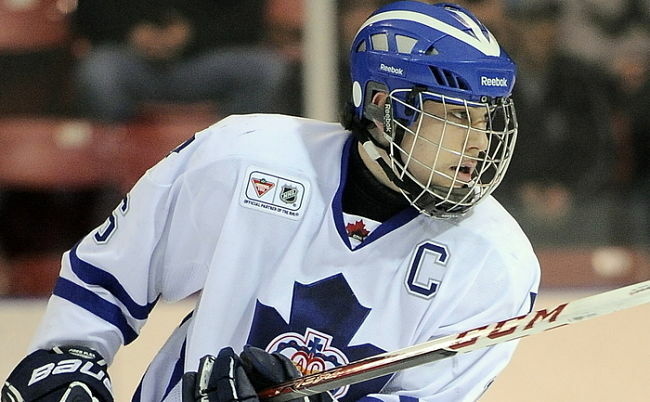 2 overall in this spring's OHL priority selection draft. "It was always in the back of our minds that we could be on the same team. We always got off on the right foot and we're pretty good friends. "It was weird how it all worked out. We got each other's number and started texting and then I got drafted there. We've played Sunday nights in this little summer league that some teams do and we've become close through that." Since that initial icebreaking, McDavid has gone on to be the OHL's rookie of the year, be proclaimed hockey's next big thing by every major media portal and establish himself as a safe bet to swell the short list of the few 16-year-olds who have worn the Maple Leaf at the world junior championship. For his part, Strome considered the most creative offensive talent among the OHL's incoming 16-year-olds, capable of being on the same career track as his 20-year-old brother Ryan, who's now on the cusp of his first full pro season in the New York Islanders organization. Ryan Strome talled 268 points in 164 games, a gaudy 1.63 per game, during his three full seasons with the Niagara IceDogs. Dylan Strome, a 6-foot-2, 170-pound pivot who styles his game after former Hart Trophy winner Joe Thornton, may be capable of posting similar numbers in the OHL. The determining factor will be whether he improves his acceleration and quickness in order to have more time and space to put that creativity into action. That's essentially been the focus of Strome's entire summer as he readies to meet up with McDavid and his new teammates in Erie. "I've been working five times a week with the gym I go to here in Missisauga, the Athlete Training Centre," Dylan Strome says. "We're working on a lot quick explosive stuff to get your feet moving faster. That's on the ice. Off-ice, Dawn Braid, who's with the Buffalo Sabres organization, I've been skating with her for a few years now. She really helps me getting the quick start and she's really good with skating strides. I know that's what i really need to improve on for the next level. All rookies have to." 1. Beyond general areas like "get faster," "gain strength," "improve my shot," what is an area of the game where you want to display improvement during your first year in the OHL? "The biggest thing I need to improve on is my play without the puck. I think people saw last year that I was pretty good when I got the puck. I can find my teammates and score some goals. The next level, it's not all about points, it's about how you play the game. You have to be better away from the puck than you are with the puck. Some games it won't be bouncing for you and you have to do other things to help your team." "My mom [Trish] actually has a couple boxes ready for me to take down in a couple weeks. A lot of guys on the ice were chirping me when I did the first interview when I said that. I guess I'll keep it up. It was working for me so I'll keep it up..
"It kind of went out of stock for a while last year. So we were running all over the place, every Wal-Mart, buying these drinks. I had it in the first tournament last year in Rochester. I scored the overtime winner in the semi and we won the final so I just kept doing it." 3. Is there a player or team you are really looking forwarding to facing in your rookie season? "There's a couple of teams. Obviously one being the London Knights. I was at the final game [in 2012] when my brother's team lost in Game 5 to London. That building was electric. I can't even imagine what it would be like to play in front of a sold-out crowd of 10,000 fans. That would just be unbelievable. Niagara would be a cool experience. A lot of people know me around the rink. They saw me almost every game last year. I had a chance to go there last year before Erie drafted me." 4. Outside of your parents, Chris and Trish, who is one person who pops to mind when you think about who deserves a lot of credit for helping you reach this point? "My hockey coach all the way from minor atom through minor midget, Wayne Gagne. I saw him sometimes more than my family. All in all, he was really good to me and always gave me a good chance to play. He's always put me in good positions to play games. His son [Joshua Gagne] got drafted to Kingston [in the seventh round] so I'm sure I'll be seeing him down the road. He's always been like a dad at the rink, at the same time it's tough having a son on your team and he managed that really well. He played in the NHL for a few games and had a good career at Western Michigan. "Mostly everything I've learned has probably been from him." 5. What's some inside info about Ryan Strome that might surprise people? "I think people are going to be really surprised at how strong he's gotten over the summer. He's worked out harder than I've ever seen anyone do before. He works out with [New York Islanders star] John Tavares every morning. I think a lot of people are going to be surprised come the training camp for the Islanders." (I was hoping you might take a little sibling-rivalry swipe at him such as, "well, he doesn't like to do housework.) "He doesn't pick up the pucks after he shoots them in the backyard, I know that."